RIO DE JANEIRO: President Dilma Rousseff hosted a luncheon Sunday with German Chancellor Angela Merkel, Russian President Vladimir Putin and other leaders before they all attended the World Cup final. 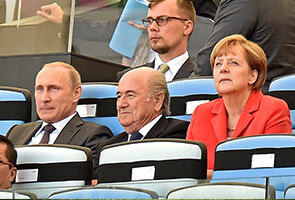 Merkel was in Rio de Janeiro to watch Germany take on Argentina at the Maracana Stadium, while Putin was there for the symbolic handover to Russia, which will host the 2018 tournament. Putin will hold bilateral talks with Rousseff on Monday before taking part in a BRICS summit in the northeastern city of Fortaleza on Tuesday. The lunch took place at the Rio government palace and included South African President Jacob Zuma, as well as the leaders of Antigua and Barbuda, Gabon, Hungary, Namibia and Trinidad and Tobago.